Party bookings: one ticket in ten free. 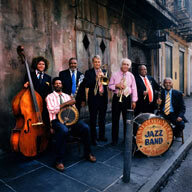 ‘Preservation Hall, now that’s where you’ll find all the greats’ – Louis Armstrong. From New Orleans, the birthplace of Jazz comes the world renowned Preservation Hall Jazz Band, their only South West date on a brief UK tour.